The day started after I dropped my little girl of at school and drove down to the harbour. When I arrived at the boat a friend told me that there was a Seal on the harbour beach and could I phone someone to tell them as she was not sure if it was ok. After a closer inspection it looked ok to me and it was a young Common Seal. Now they are not so common around here and less common to be on the harbour beach so it was really nice to see. I took a few pictures but not very many as it did not want me there. 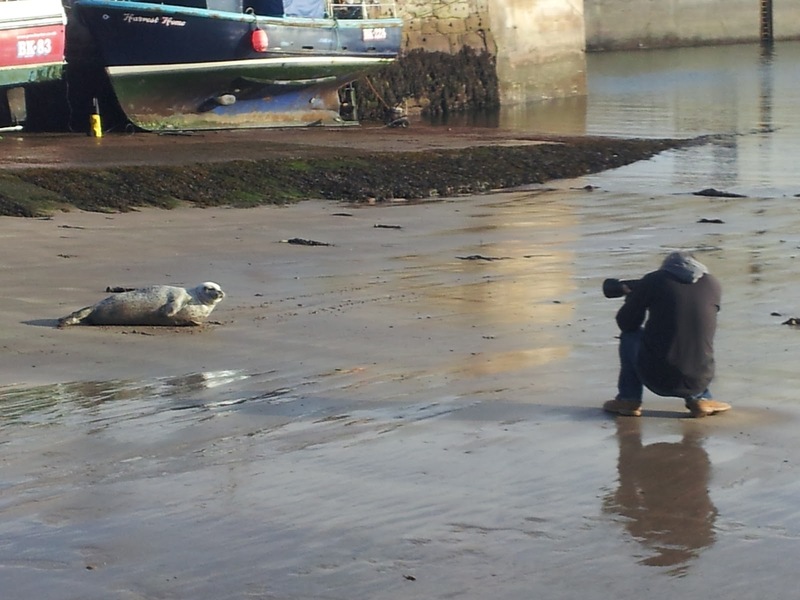 As I left the seal to be along, someone came along with their dog and frightened it away. Some people just don’t care but the seal was wise, as it went around the corner and went to the other beach were it would not be disturbed. This is the second Common Seal I have seen this year and the one I saw on the Farne Islands in early September was the first Common for many years, from what I can gather. We left the harbour with our guests at 10.45am to see the Grey Seals around the Farnes. The numbers of seals are building day by day now and all around the north side of the Islands there were covered in seals. We have up to 6 Grey Seal pups now and the first pup of the year was a boy and it has been named Rocky by the Farne Island Rangers. Further around the Islands we noticed a few seals playing. At first the guests thought they were fighting but as they watched they realized it was just playful fighting. After watching them play for a while we went around the corner and noticed a weird looking seal. This seal looked like it was rusty coloured. Now I don’t know enough about seals but this might just have been pigments of the skin. If anyone knows anything about the colour or why this is, then please let me know. One half of the seal is still wet that’s why it looks a bit different. After the day had finished and we tied the boat up, a Starling flew down to say hello. What a nice way to end the day.